Black Tupelo | Henry Field's Seed & Nursery Co.
One of the Best for Fall Color! 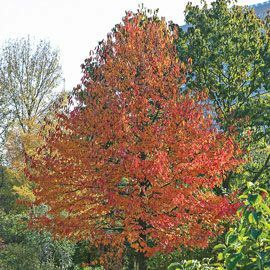 The Arbor Day Society calls this tree one of the ten best trees for fall color. Glossy dark green summer leaves turn shades of red, scarlet, orange, yellow and purple—often all on the same branch! A native to the eastern United States the Black Tupelo, also known as Black Gum, grows 30 to 50 ft. tall. Bareroot. Zones 4-9. Spacing: 20 - 30 feet. 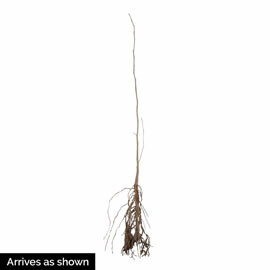 Depth: Plant so the stain on the roots are at soil level. Water thoroughly after planting. Spread: 20 - 30 feet. Foliage: Glossy, dark green Summer leaves, turning to shades of red, scarlet, orange, yellow and purple in Fall. Form: Deciduous. Upright, oval, irregularly shaped canopy. Soil Requirements: Well-drained, acidic soil. Fruit: The fruit is round, dark blue, and clustered on stalks up to 1 1/2" long.- Birds loved it. It does not produce the gumballs that the sweet gum produces.